An incredibly detailed map of Singapore and Johore Bahru published only months before the Japanese surrender. Singapore and Johore Bahru. HIND 1035, SHEET 3L/12 4th Edition. 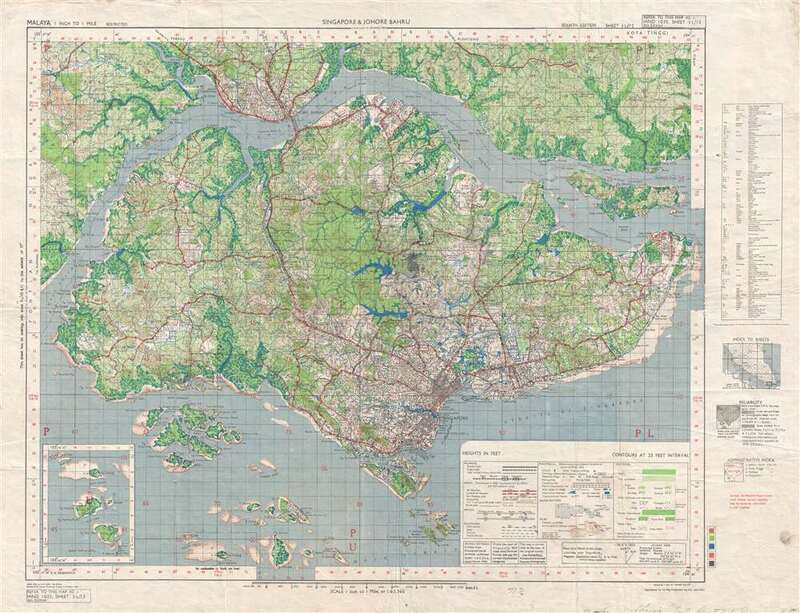 This is a 1945 British Army map of Singapore and Johore Bahru, Malaysia. The map depicts the region from the Lee Wah Blank Estate to Changi Airfield on Singapore and from an airfield north of Johore Bahru to Selat Sudong. Highly detailed, myriad locations throughout the region are labeled, including private estates, villages, mountains, and rivers. Individual buildings in Singapore City are illustrated and some are labeled, including the Victoria Memorial Hall, the Singapore Volunteer Headquarters, and the Botanical Gardens. Johore Bahru is depicted with the same level of detail, illustrating individual buildings and labeling the most important. Roads and railways are also included, with different notations used to differentiate between the different classifications of roads and railways. An inset map depicting Pulau Senang, Pulau Pawai, and Pulau Sudong is included in the lower left corner. A key explaining the various symbols and notations used throughout the map is situated in the lower right corner. This map was originally published by the Survey Production Centre of the Allied Land Forces South East Asia (A.L.F.S.E.A. ), with this example printed by the IIO Map Production Company in June 1945. Good. Soiling. Wear along original fold lines. Some loss. Blank on verso.